Getty Images/Mark WilsonPresident-elect Donald Trump and his wife Melania Trump are greeted by President Barack Obama and his wife first lady Michelle Obama, upon arriving at the White House on January 20, 2017 in Washington, DC. 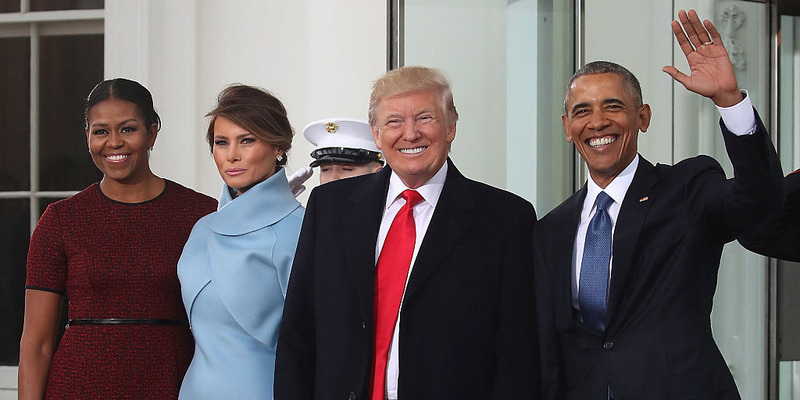 The former first lady, Michelle Obama, used a parenting analogy to describe the differences between President Barack Obama and President Donald Trump. She likened Obama to the “good parent,” who encourages healthy behaviour, and Trump as “the other parent,” who takes a lax approach to the things he’s in charge of. This is what happens “when we take things for granted,” she said. The former first lady, Michelle Obama, used a parenting analogy to describe the differences between President Barack Obama and President Donald Trump during a panel discussion at the annual Simmons Leadership Conference in Boston on Thursday, People Magazine reported. “And now we have the other parent. We thought it’d feel fun, maybe it feels fun for now because we can eat candy all day and stay up late, and not follow the rules,” she said, loosely referring to Trump’s freewheeling style of governance. Obama remains active politically, but she said she “never had the passion for politics,” and that’s why she has no plans to run for president. The former first lady’s highly anticipated memoir, “Becoming,” is set to be released on November 13, 2018.